Diane Helfers Petrella, an experienced soloist, collaborative pianist, speaker, and adjudicator, is currently Assistant Professor of Piano and Piano Pedagogy at the University of Missouri-Kansis City Conservatory of Music. Nick Petrella is the Director of Education for Sabian Ltd. In addition, he maintains a full schedule as a performer and has commissioned and premiered over a dozen new compositions. In 2002, Diane and Nick Petrella formed the Petrella Ensemble, which is dedicated to commissioning and performing new works for piano and percussion. Authors Diane and Nick Petrella say that, because they have benefited personally and professionally from the study of music, they want to help others have the same opportunity. So, on an annual basis, they will donate 10% of the profits of The Musician's Toolbox to organizations that support music education. The authors goal in writing this book is to help develop a fresh approach to nurturing musicianship in all disciplines and age groups. They correlate musical 'tools' to tools in a box. The idea is that the more tools you have, the better prepared you will be. The 111 'tools' in this book are designed for both teachers and students of music. Following each tool (or idea) are projects intended to assist you in putting that tool into action. As any tool is only effective if used at the right time and in the right application, it's important to think about the timeliness of each of the concepts and projects as you read through this book. The authors suggest that you decide which tools are most appropriate for you at the moment and focus on those. As your skills develop, you're encouraged to return to the toolbox to select a new tool that will help you accomplish your next goal. You will, eventually, use the ideas to develop your own and continue to fill your toolbox. Ask a student to demonstrate a variety of emotions through a simple, musical activity. Teach students how to tune, maintain, and repair their instruments. Realize that you will always be a student of music. Learn how to get optimum results out of minimal practice time. Work to develop the visual aspect of your playing. Practice in an environment that simulates a performance situation. Listen to many different styles of music. Use musical words such as "sounds" and "play " rather than "noise" and "hit." Identify and eliminate tension in your playing. Help others heal through music. This is a great book that's full of ideas and tips. Separating them into appropriate chapters is very useful when you're looking for help in a specific area, such as teaching or learning. The bottom line is that every musician, regardless of instrument, can find something useful in this book. Not only is it filled with inspiration but each tip contains a practical project that you can use to put the specific idea into practice. I recommend it to all musicians of all musical styles. 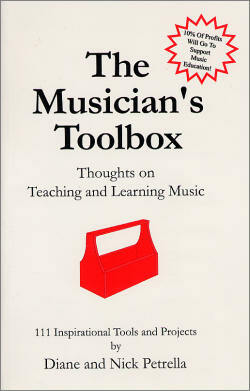 The Musician's Toolbox is available for $9.95 (USA) and $13.95 (Canada) directly from www.themusicianstoolbox.com.